Now that it’s December, I know that I’ll constantly be wearing a coat which is both a good and bad thing. Coats and jackets are probably one of my favourite purchases to make and since high school, I always had a lot. I mean, in comparison to my best friend Carolina, my number is not nearly as high but it definitely is to the average person! 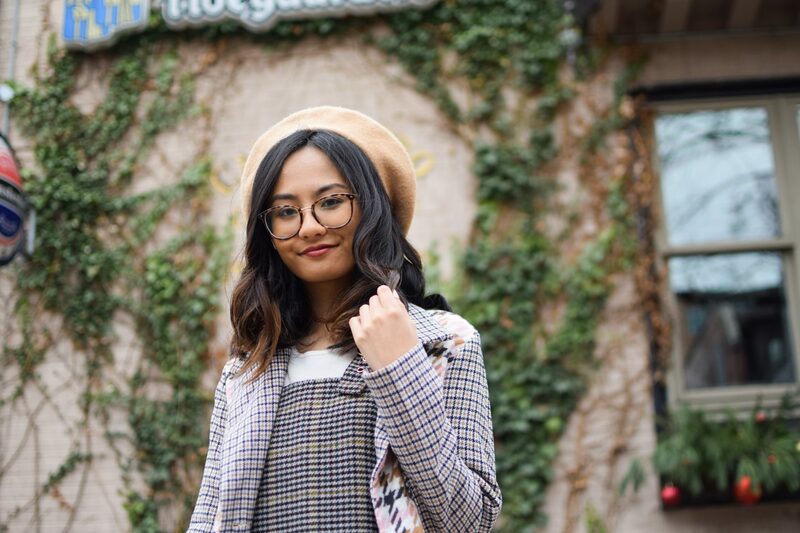 One of the latest coats in my collection is this mixed houndstooth print from SheIn. It’s such a statement piece and I realized that I have quite a few statement coats; whether it’s because of the print or fabric, I’m 100% drawn to them. For today’s post I decided to show you 3 different outfits but explain the different ways I style it so you can try to use this tips for yourself! One of the easiest and more everyday type of outfit I would wear is more of a casual look. I let the coat do the talking because it makes such a statement. I paired it with my favourite corduroy pants from Forever21 and paired it with a good ol’ off white sweater from H&M. These cord pants are my go-to pair since it matches everything so even though the overall outfit looks very put together, it was fairly simple by grabbing those items! I tend to wear that sweater and pants together a lot and just change it up with the jacket! 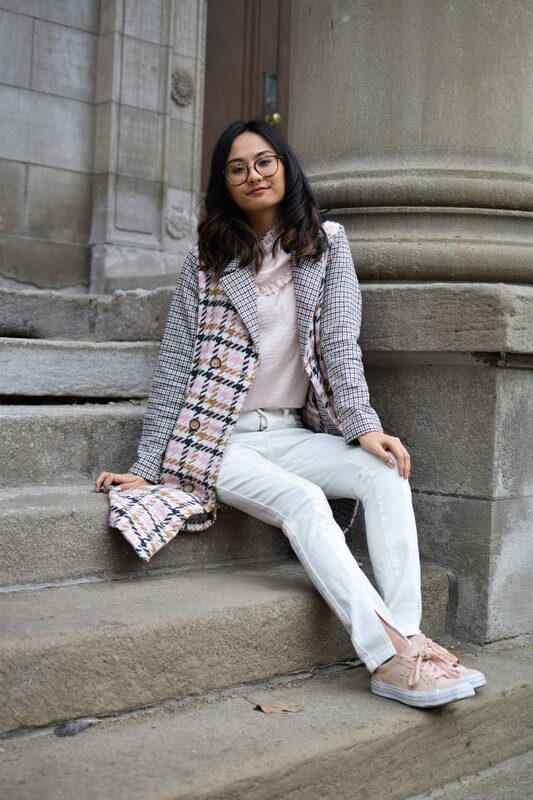 A fun way to style statement coats is by pattern mixing. Even though pattern mixing isn’t everyone’s cup of tea, there are different ways of doing it! Usually I like pairing very different prints but one of the ways that I learned from Carolina actually is by pairing the same print but in different sizes. 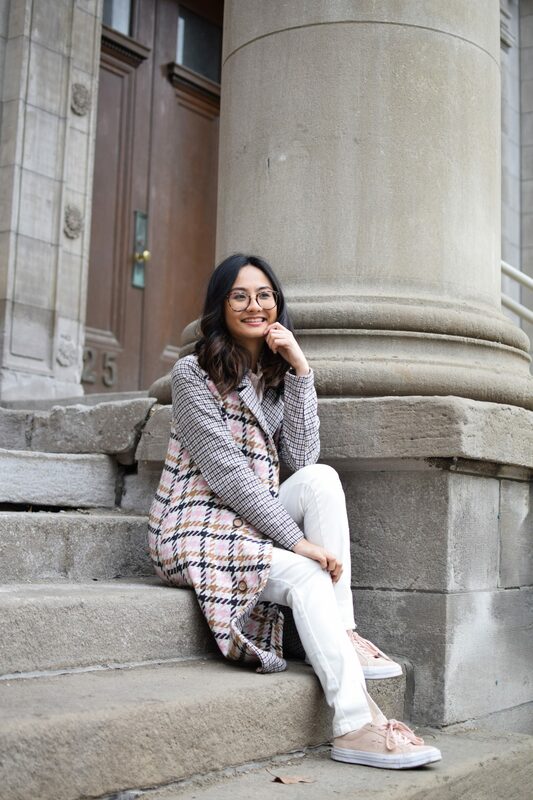 If you notice, there’s a smaller houndstooth print on the sleeves of this particular coat already so I decided to pair it with another houndstooth print that was almost the same size. The smaller print has only neutral colours so it matched well with the overall dress! 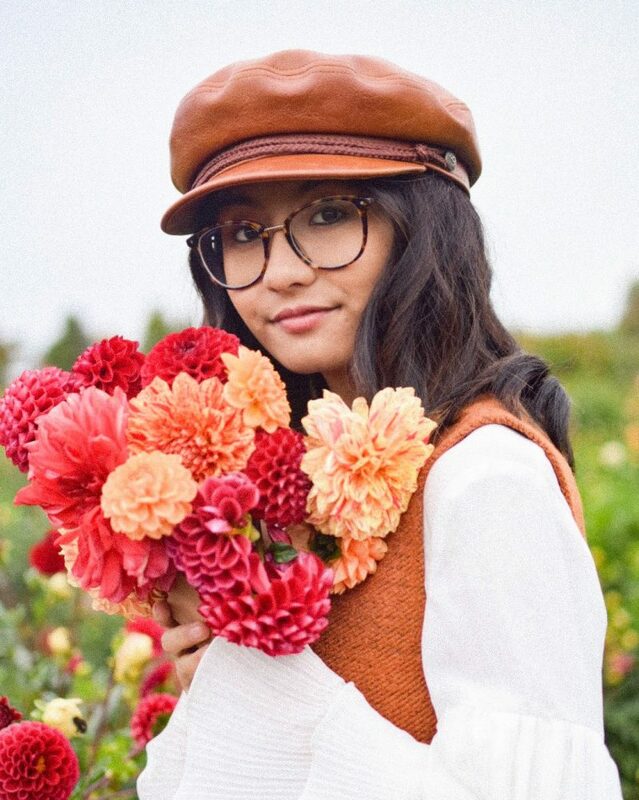 To add some more colour coordination in the overall outfit, I paired it with a camel beret. The last way I love wearing statement coats is by having it perfectly coordinated by colour. Since there are a lot of colours in this, I decided to go with the blush pink tones for this outfit. 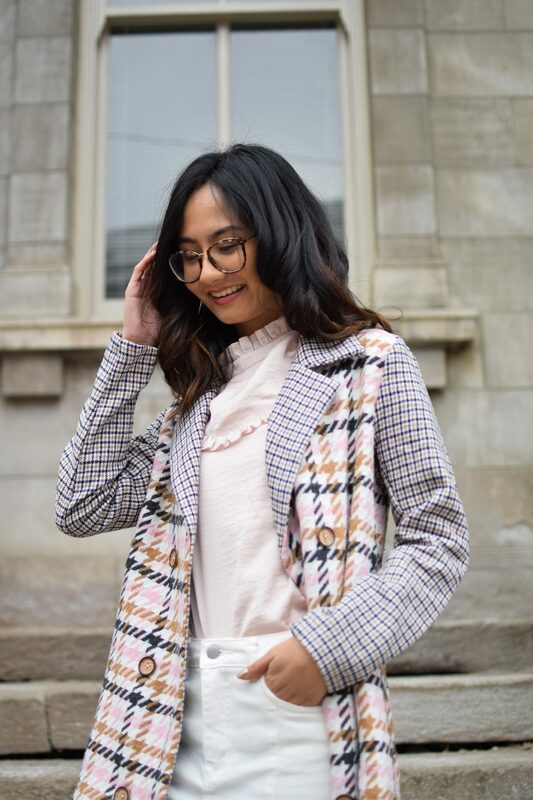 I went casual with a pair of light pink Converse and decided to wear a matching coloured blouse that you’ve seen those two items paired before on my blog! As for pants, I thought it was best to wear white so I pulled out these new ones that I got from Na-kd recently. If you n otice, it’s the exact same pair of jeans that I ALWAYS wear on my blog, just a different colour haha. I love the middle seam on the pants because it’s a very subtle detail but adds more to an outfit versus a regular pair of high waisted jeans. Would you ever wear a statement coat? Let me know how you’d style it in the comments below!